One of the things which I love looking at is monumental Victorian engineering. However, there is a side to these buildings and constructions that people rarely think about – and that is how did they know if the materials used were safe? At the time of the Victorians, many of the newish industrial materials were still fairly new and untested – so while a massive brick arch for a railway bridge was a long known method of spanning gaps – doing the same with thin bits of iron was a bit novel. Hence, materials testing. As the company was family owned, he realised that promotions to directorship were not likely so he left to set up his own testing company. Despite being Scottish, and most foundry work being in the Midlands – he set up his testing company in London. The reason being that he wanted to be near the various institutes of engineering in London – and the offices of government and big companies who would pay the bills. 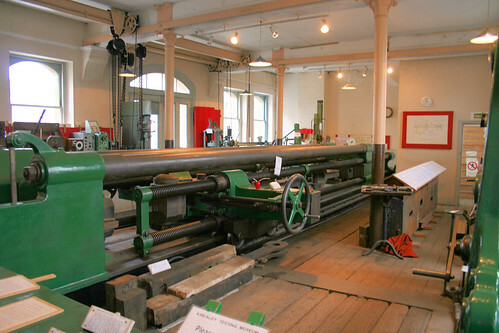 His masterpiece was the Kirkaldy Testing Machine – a monster of a device that is 47 feet long and weighs 116 tons. The reason it was so massive is that testing in the early days was not carried out on samples of materials – but on actual finished products. Metals were still fairly impure – by modern standards – so testing was carried out on final finished units and it was presumed that along the length of a piece of steel or concrete, the imperfections would be roughly the same for all components. Today, the purity of materials is such that only tiny samples are really needed for testing. David Kirkaldy constructed a custom designed building – with the main testing machine on the ground floor, a basement with secondary testing equipment and the pumps for the hydraulic water to power the machine (later powered by the London Hydraulic Power Company) and upper floors for storing used test samples and offices. It was to see this monster sized machine that had me wandering down to Southwark on a bitterly cold Sunday morning – as the building still remains, as does the testing machine inside. Whilst the upper floors are now offices, the ground floor has been given over to the museum (a legal ruling preserves it almost forever in that venue) and the place is open on the first Sunday of the month to visitors. Once you get to the museum, there is a small sign directing you to go round the back, and there you will find a locked door with a small sign and a doorbell. Ring and someone will come to let you in. As the building is still a working environment to some degree, they can’t just leave the door open for people to wander around the place unescorted. You are shown a short video in the basement which goes into a nice bit of background about why materials testing was needed and the history of the Kirkaldy Testing company – then volunteers take you round in small groups to see the machine, and all the other bits of testing kit the museum is building up a collection of. I also picked up a reproduction copy of the only advertising leaflet the company ever produced. After that, sales were solely by word-of-mouth such was the reputation of the testing machine. I guess we were there for about an hour in total – and the visit is free, although donations appreciated. The museum is open on the first Sunday of the month between 11am and 3pm – or by appointment at other times. They don’t seem to have a website though – but their address is 99 Southwark High Street. That shoes how observant I am – we pass this every time we visit London (we stay just down the road) and I’ve never even noticed it! Must try harder. I’ll definitely be visiting next time – thanks for that one! Its a pity that fewer people know about it as it is quite an interesting place to visit. I guess the lack of a website in our modern age is a factor though, as I was slightly worried that the various snippets about their opening hours I had found might be wrong. I was delighted to see they were in fact, correct. It is great museum, I went a few years ago and spent all afternoon there. At the time, my wife and I were very keen to help the team. We offered to create a website for them and help promote it, but they seemed reluctant to embrace the idea, so sadly it never happened. I visited on Open House Weekend – it’s an amazing place. Didn’t manage to get such a good shot of the machine as you, though! I found it by pure happenstance while doing a guidebook-less walking tour of London one Sunday afternoon (after 5). Easy to overlook and if you are not on foot you probably would. Very close to the Holiday Express for those thinking of giving it a look see and wanting a place near-by. I looked in the window, saw the big machine and read the little history and really wished it had been open that day. Definitely something for my next trip. Having gone past this in the car very briefly i noticed this massive namesake plaque on the windows above, this is a must see visit for me. I was gobsmacked, having been an engineer most of my life and no other member of my family were keen engineers such as me, its really weird almost like a second life. I will be avidly waiting at the door for a tour, cant wait. I live fairly close to this place, but had no idea of its existence, will have to visit. This has correct details on opening dates and times. 6 Pings/Trackbacks for "The Kirkaldy Testing Museum"